The French Institute of South Africa is proud to announce the first edition of Ubuhle Bendalo, an urban art residency devoted to street art in all its forms, curated by Breeze Yoko. 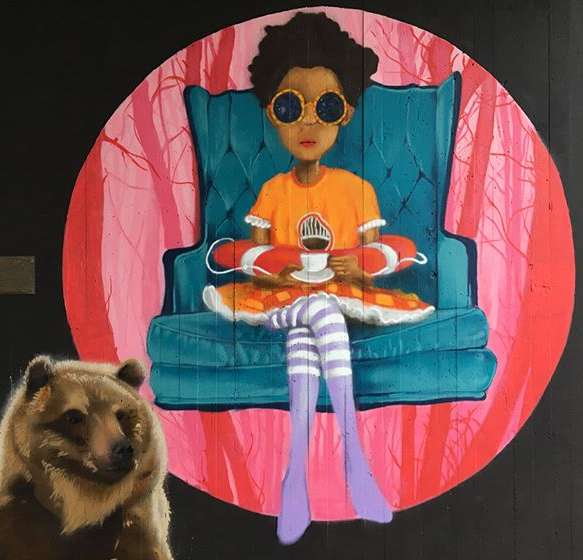 Street artists Sitou Matthia and Doudou’ Style are coming all the way from France to join South African street artists Mr. Ekse and Breeze Yoko to paint murals in Braamfontein. A sketch battle will take place at Grayscale Gallery in Braamfontein, and an artistic workshop for women hosted by Trackside Creative will also be held in Soweto. The aim of these events is to open up a cross-continental conversation and an exchange of skills between street artists from different backgrounds. Urban art has undergone a major transformation in the last twenty years, shifting from what was previously denigrated as vandalism to a greatly respected, highly innovative and increasingly lucrative art form. Street art has arguably been the most exciting and dynamically evolving area of the visual arts space in recent decades, caughting the imagination and attention of the general public, collectors, curators, property developers and urban planners. Although drawing on walls is an age old practice in Southern Africa, urban art is a relatively new artform. The local scene is still growing, with very few platforms that support cultural exchange. Through a series of events and residencies ‘Ubuhle Bendalo’ is aiming to change this by creating meaningful collaborations between local and international artists to share experiences, ideas, practices and techniques, and by contributing to more female presence in local and international street art scenes. Breeze Yoko is a Cape Town-based multidisciplinary visual artist specialising in graffiti/urban art and video. Yoko has painted in over 13 countries and has participated in urban art projects and festivals in South Africa, Botswana, Mozambique, Senegal, Germany, Sweden, France, London and many more. As well as producing visual art, he has curated a number of urban culture events and exhibitions including ‘Street Talk’ (2014) featuring some of South Africa’s prominent street artists, and ‘Deep Memory’ (2017) at Kalmar Art Museum Sweden, featuring contemporary artists from around the globe. After studying finance, Matthia changed careers and is now totally dedicated to his passion, urban culture. Matthia started the first graphic arts studio dedicated to screen printing and street wear with his partner Kuessan Dangbo in Togo, where he is originally from. In search of new horizons, he travelled extensively in West and Central Africa, working as a graphic designer, and organised many festivals and exhibitions to promote urban culture. Today settled in France, Matthia conducts research around colours, and especially their mixture, their “cohabitation”. Jessy Monlouis-Bonnaire, aka Doudou’ Style is a French self-taught artist – primarily a painter, graffiti artist and illustrator, who offers a colourful, voluptuous and poetic universe, inspired by cartoons, comics and manga. Driven by the desire to travel and to integrate art into our daily lives, her talent is redefined and nourished through exchanges, meetings and sharing, giving rise to many artistic collaborations with other urban artists.